The last photo is particularly relevant because it's one of our members' sons holding the glider. There's no way that he could have lifted my full size Falcon, but he was able to manage with Lite Hawk. In fact, it looks like he's having more trouble with the size of the helmet than the glider! 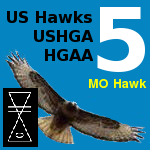 I took the planform that I got from the photograph and digitized the outline to give me a template for Little Hawk. Then I wrote a Java program to rotate it in 3 dimensions and output 64 individual snapshots (with some primitive "clouds" added for a sense of vertical motion). Then I integrated those 64 snapshots into a single animated GIF file. What do you think? Just like you said ... Go, go, go Little Hawk!!! The version shown is a thermalling event. With the same set of frames, I am guessing a glide down could be had. Maybe reverse? Or cycles? Lift use and then sink? Not sure. I knew I had asked the right guy!! Joe, I believe you can see things that the rest of us cannot. The main reason there's no pilot is that I hadn't gotten to it yet. 3-D solids require more programming than 3-D lines and planes. But you're right that the empty control bar begs to be filled. I never saw that, but you did!! I have no idea what this will become. It started out because I had taken a picture of Little Hawk's planform and that gave me a shape that I considered using for an animated avatar. I like programming projects, and it was a nice exercise in sanity. Programs are logical. They do what they're supposed to do. I think I needed a little of that ... given what's been going on with USHPA and the HGAA. I'll probably continue building on it from time to time. I think the first step would be to add better clouds so it looks like it's climbing into the sky rather than being bombarded by giant bird droppings. I may also configure it to create custom avatars with different sizes and color schemes. I may add different flight patterns like a figure 8 or a loop. I might even turn it into a flight simulator with an optional weight-shift pilot. Or I might just move on to other things. Either way, I do believe you're a visionary Joe, and it's been my privilege to know you. Those photographed in the original Little Hawk are going to be a special group. Watch out for the rush! I took Little Hawk out for its first introduction to the general public today at UCSD. I had about half a dozen students and visitors interact with it (holding it, running with it, hanging from it). Unfortunately, I was so busy helping people with the glider that I didn't take very many photos. But here are a couple that I did think to take. The first two show a Korean war veteran (who also went through US Army Jump School in Fort Benning!! ), and the last one shows a student who's very interested in hang gliding now. Little Hawk is working out just great already!! That little glider is doing BIG things!! // This class provides some handy "global" data. // This is different from the common aviation use of z as altitude!! int delay = 1; // This will be changed by init, so "1" is fine. // This is the constructor for the class. It is called when a new instance is created. If it works, you should see a new window with Little Hawk soaring happily into infinity. If you get errors, then you may have to install the Java Development Kit (JDK) on your computer. Feel free to call me at 858-204-7499 if you'd like to start programming in Java and I might be able to help you through the JDK installation process.